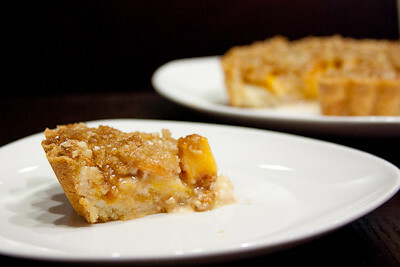 I halved everything in this recipe, except for the streusel topping because you really can't have too much of a good thing :) In the end, I think the amount of topping was just right (although it did obscure my beautifully slices peaches). 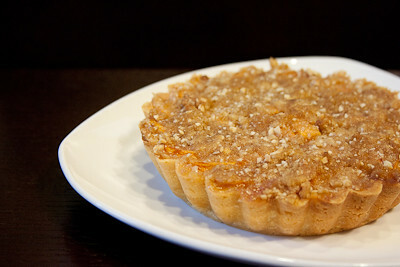 If I ever get around to making the full-sized version of this tart, I will definitely double the topping! Thanks Rachel, for hosting this week. I loved this tart. The creamy custard had just a hint of almond that complemented the peaches perfectly. I think I'd choose this tart over a peach pie, any day. If you would like the recipe, you can find it here. Make sure you check out the TWD Blogroll, to see how everyone else enjoyed this peachy treat! Your mini tart looks great! And good call on doubling the streusel! Thanks for baking with me this week! Darn, I used up my peaches yesterday in cobbler. Well, at least he didn't bring plums or something. :) My honey does the same sorta thing. Btw, how's your sweet babygirl? Getting bigger and cuter I'm sure!? I had every intention of making the tart. I still have peaches on my tree, but it just got too darn hot to bake. Your tart looks lovely. Oooh that looks lovely!! So funny about your husband- I have to literally write descriptions of everything I need from the grocery store if my bf goes alone... And then he calls me 6 times from the store! My dad, on the other hand, does ALL the grocery shopping or he and my mom. Lucky lady! Oh wow that looks heavenly! I think I need to make this soon! I LOVE struesel topping as well and agree about doubling it. Men. They mean well, don't they. Your lil tart looks delicious! i'll bet the peaches had just the right texture to compliment the custard. great job! This couldn't look any better! I hope you do get to make it again (and I'm doubling the topping next time, too). Extra streusel is always a good thing! Lol, I always do my own shopping, otherwise it usually gets messed up! Beautiful mini tart! Usually when I send my husband for something, if I give him too much information, he comes home with the opposite of what I asked for. I loved this tart and will make it again and again!